VOLT® Lighting, leading factory-direct lighting manufacturer, launches the new feature-filled Woodsman series of landscape lighting downlights. The line includes two models – the first with LEDs integrated into the luminaire body (for faster installation) and the second that uses interchangeable LED bulbs (for greater design flexibility). VOLT® Lighting Landscape Lighting Woodsman LED Downlight. Lighting Pros not only want downlights to be easy to install, they want them to be maintenance free. VOLT® Lighting, leading factory-direct manufacturer of landscape lighting products, announces a new series of low voltage downlights – The Woodsman. These lights, developed by VOLT® engineers in their Innovation Laboratory, feature many new and unique innovations. Several new features address the challenge that Caselnova describes. The first of these focuses on ease of installation. Unlike other downlights that are relatively large and heavy, the Woodsman are compact and lightweight. This makes them easy to handle at the top of a ladder. Another feature that eases installation is the construction of the new fixture mount. It has a tripod shape that offsets the luminaire several inches from the tree bark. The installer first attaches the mount to the tree. Then, the fixture slides into the mount. A simple hand-tightened retainer ring secures the light in place. Compared to older style mounts, this new system is faster, easier and safer. In addition, the offset mount prevents mold growth to protect the health of the tree. Another feature that makes these lights maintenance-free is the watertight construction. Many downlights have a known problem of water leaking into the fixture. This is typically due to water entering the fixture knuckle then traveling along the wire into the body. A unique feature of the Woodsman is that the wire never enters the knuckle. Instead, the wire exits at the bottom of the fixture looping in such a way that water cannot enter the body. The introduction of the Woodsman Downlights, marks one more product series in a long list of new products – numbering over 200 in the last two years. VOLT® continues to lead the landscape lighting industry in new product development. And, since it operates on a factory-direct model, VOLT® manages to offer these new products at price points attractive to both homeowners and professionals. 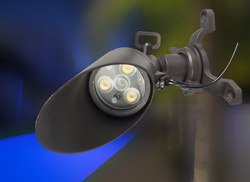 VOLT Lighting is the leading factory-direct manufacturer of landscape lighting products. With an aggressive product development program, the company continues to innovate, inspire, and support the outdoor lighting market. For more information, go to http://www.voltlighting.com or call 813-978-3700. VOLT® Lighting – direct-to-consumer – lighting manufacturer and distributor One of VOLT® Lighting's warehouse & distribution centers.